Award-winning Taiwanese novelist William Lien (連明偉) has always had an eye for overseas adventure, performing his military service by teaching Chinese in the Philippines and working odd jobs in Canada and Hawaii after that. So when he saw an offer online a few years ago to volunteer in St. Lucia, a diplomatic ally of Taiwan, to teach table tennis, he was very much intrigued and decided to give it a try, seeing it as an opportunity for a new experience. Beyond testing himself, however, he would also be serving as an unofficial ambassador for his country because the position was advertised by TaiwanICDF, a government-funded agency that runs the country's foreign aid programs, as part of its volunteer program. Recognized by only 17 countries worldwide, most of them in Central America, the Caribbean, and the South Pacific, and with limited resources to combat China's relentless attempts to poach its allies, Taiwan has had to get creative in promoting diplomacy. A key traditional diplomatic tool has been Taiwan's overseas agricultural, technical and medical missions handled by TaiwanICDF that offer advanced training and expertise. But a lesser-known function of the group in promoting the country's interests is to recruit volunteers willing to serve overseas. The first group of TaiwanICDF volunteers departed for Swaziland (or eSwatini as it is known today) in 1996, and a total of 743 volunteers had served abroad in 39 countries as of December 2018. These volunteers contribute unique, and sometimes rather eccentric, expertise to people in allied countries, serving as English, math and dance teachers and baking/pastry chef instructors, to name just a few. TaiwanICDF even once tried to recruit a Qigong practitioner to teach the ancient Chinese exercise/healing technique involving meditation, controlled breathing and movement exercises. But it ultimately gave up because it was too difficult to find a qualified Qigong master who spoke English or Spanish and was willing to travel afar to serve as a volunteer with little pay. 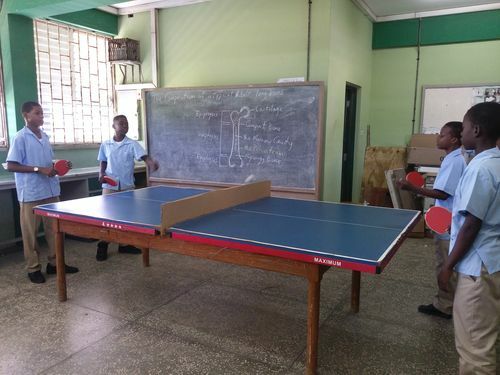 According to TaiwanICDF, all of these volunteer positions are created at the request of allied countries, and perhaps the most eye-catching request has been from Caribbean ally St. Lucia for a table tennis coach. Lien, who was won almost every major literary prize the country has to offer but also played table tennis on his university team and has coached the sport in Taiwan, did the job in St. Lucia from May 2017 to May 2018. In a recent phone interview with CNA on his experience, Lien said table tennis was not really popular in St. Lucia and there was only one qualified coach in the entire country. But St. Lucia has a rich history in the sport, winning several Caribbean championships decades ago, and "now they want to rekindle that old glory, which is why they asked for Taiwan's help," he said. As with all TaiwanICDF volunteers, Lien was given a round-trip ticket and a limited monthly stipend well south of US$1,000 a month (the amounts vary by country) for living expenses. He quickly found out, however, that the job was far more challenging than he ever expected, starting with its long hours. Lien said he woke up at 7 every morning to take a bus to a school where he would meet St. Lucia's one table tennis coach. The two would then spend the whole day touring the country to teach the game. In the morning, they would offer instruction at select elementary and high schools. After a short break around noon, they would then travel to a training center to teach national team athletes until late evening. "I usually got home around 8 or 9 every day, exhausted," he said. 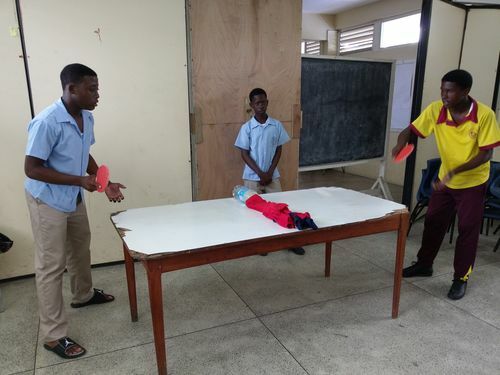 He also had to find innovative ways to cope with the limited resources available to the sport in St. Lucia, as table tennis rubbers (the material used to coat a racket's surface), nets and tables themselves were very expensive and hard to get. "To save money, we bought thin custom-made wood boards and painted them different colors to use as tables and even used a wooden board as a net," he said laughing. As if teaching itself was not challenging enough, Lien said it was also difficult to blend in a place where there were few Asians. He was regularly taunted, as local residents would make fun of his accent or speak made-up mandarin in front of him as a joke, which hurt even though Lien said he knew they were only doing so out of unfamiliarity with a foreign face. That doesn't mean he thought the experience was unrewarding; in fact, he feels just the opposite, especially in seeing the young St. Lucians he coached improve over time. Lien praised their huge potential, saying they were fast-learners and far more athletic than Taiwanese players. Now that Lien has returned to Taiwan, the St. Lucia job is open again, and he gave it a ringing endorsement, saying his one-year journey was inspiring. "You will face many challenges there, but it is all worth it," he said to people thinking about volunteering, describing the journey as one that taught him how to see the world from a different perspective and gave him a deeper understanding of Taiwan's diplomatic situation. It also made him more flexible and more adaptable to new environments and new challenges. "Walking out of your comfort zone is important. Don't be afraid of failing and making mistakes," he said.